At the heart of Spain’s Catalonia region lies a cosmopolitan city called Barcelona. With a rich cultural and architectural heritage, It is nearly impossible to explore all that Barcelona has to offer in one short trip; more so if you lack proper logistical plans. As such, people have discovered that one of the best ways to conveniently maneuver through the streets of Barcelona is by bike. The government has also played its role in facilitating the biking culture in Barcelona by constructing biking lanes that total to about 300 kilometers. This article will provide insightful information on exploring the streets of Barcelona by bike. These tips will entail, how it feels like exploring the streets by bike, where to hire these bikes, routes to follow and places to explore. What does it feel like biking in the streets of Barcelona? Apart from the eco-friendliness, bike tour Barcelona provides an epic sense of fluidity and tranquility. This feeling is attributed to the bike trails constructed along pine scented regions, user-friendly parks and the safe cycling lanes in Barcelona. Where can one get a Bike? Technology has made exploring the city of Barcelona by bike quite efficient. Getting a bike is as easy as going online and searching for biking businesses around your location, select a pick-up location and the delivery time. Some companies have made it even more convenient for their customers by positioning locked bikes in multiple locations within the city. All you need to do is make an online payment, unlock your bike of choice and you are good to go. Exploring the streets of Barcelona by bike can be even more effective and affordable through a guided bike tour. Currently, Free Bike Tour Barcelona is the only company offering free tours that capitalize on this. All one needs to do is visit www.freebiketours.com and make a booking. The website bears a friendly user interface that eases comprehension, thus speeding up the booking process. Apart from the daily 3-hour Bike tour, the company’s website is regularly updated with tour packages offered and the landmarks to be visited. The website also provides crucial information on meet up points, rates chargeable and qualification criteria. Book a free tour and enjoy one of the cheapest, safest and most fulfilling biking expeditions in Barcelona. Known in Catalan as Barn Gotic, biking along the streets of this region enables you to explore the architectural heritage of Barcelona. This experience is characterized by the numerous ancient palaces, the “Temple of Augustus,” among other facilities. This location provides a relaxed environment for intimate bike rides. Among the experiences include a picnic pit stop, a waterfront at the end and a view of “Arc de Triomf,” a historical monument. It also provides access from the city center and into the beach, should you decide to combine the street tour with some beach activity. 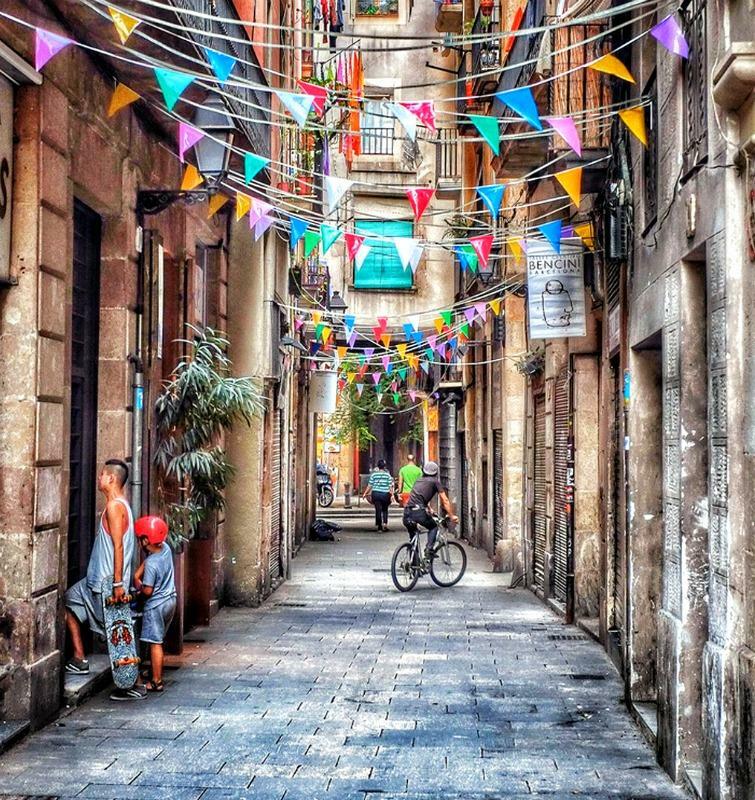 Located at the northern end of the Barcelona City Center, cycling along El Pobleneou provides insight into the vibrant Catalan culture and history. Among the captivating encounters are old textile mills transformed into works of art by Barcelona’s streets artists.